Let's start with some honesty - I only get my hair cut twice a year at most. I trim my own split ends at home. When I got bangs, I thought I was going to have to change that habit, and my wallet was none too pleased. So instead of succumbing to broke-ness, I dug in and researched. 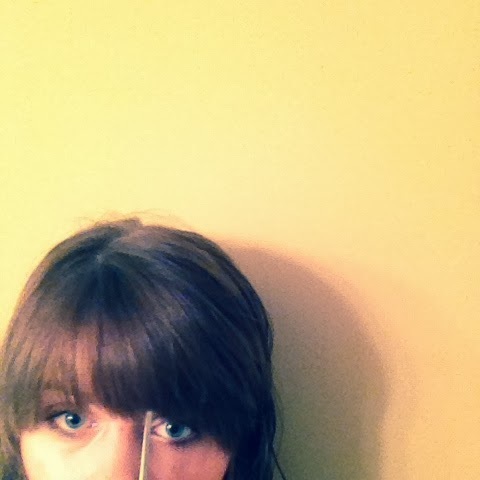 Now, I trim my own bangs - pretty successfully, if I do say so myself. Here's some pointers to keep your bangs tidy between haircuts, regardless of how few and far between they may be. Its tempting to cut straight across, because it's one snip and done. But your bangs will look like a shelf of hair if you do that - not a good look. Cutting vertically in small snips keeps that piece-y look that your hairstylist cut in when you first got them so you look like you got a professional trim, not like an overzealous 5 year old's Barbie. 2. Cut 'em dry. This is probably the biggest mistake DIY trimmers make. When your hair is wet, it's longer than when it's dry. Cutting your bangs wet often leads to chopping off more than you meant to, only to realize it when you dry your hair and it's too late. Dry cutting makes sure that you're only trimming off what you need to. 3. Keep to the middle. If you had a good stylist, your bangs aren't a straight shot across your forehead; they're shortest in the middle by a tiny amount, frame your face on the ends, and are blended into the sides of your hair. We can't recreate that, because we did not attend the same school of hair magic that our stylists did. 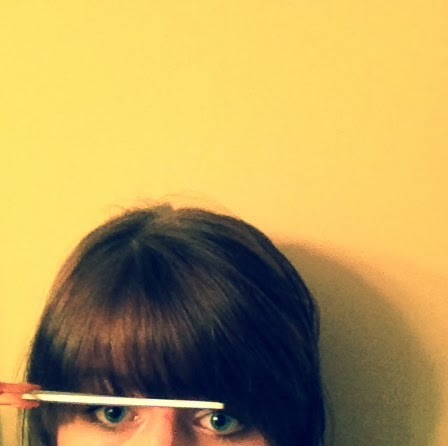 When you're trimming, keep most of your snips towards the middle of your forehead, where you bangs are shortest. That's where the annoying hairs getting in your eyeballs are located anyway, right? Stay away from the blended sides, because you can't do it. Believe me, I have tried. It wasn't pretty. Follow these three tips and you can cut your amount of trims in half!